The structure of compensation for hospital/health-system employed physicians is a constant struggle for administrators with the rise of physician practice acquisitions and subsequent employment of these physicians. Based on estimates from Jackson Healthcare1, approximately 35 percent of all physicians are employed by a hospital/health-system. As a result, the issue of how to structure and benchmark physician compensation has emerged as a leading topic among both valuators and hospital/health-system administrators. In this article, the author discusses the pros and cons of the work RVU compensation model, the most popular model. The structure of compensation for hospital/health-system employed physicians is a constant struggle for administrators with the rise of physician practice acquisitions and subsequent employment of these physicians. Based on estimates from Jackson Healthcare1, approximately 35 percent of all physicians are employed by a hospital/health-system. As a result, the issue of how to structure and benchmark physician compensation has emerged as a leading topic among both valuators and hospital/health-system administrators. 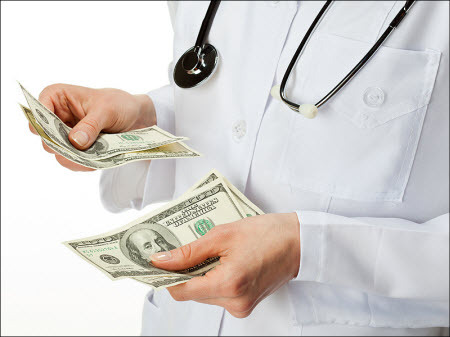 Traditionally, employed physicians have been compensated for clinical services utilizing a variety of methods including, but not limited to: base guarantees, compensation per work relative value unit (work RVU), base salary plus productivity bonuses, percentage of practice pre-compensation earnings, percentage of professional collections, and more recently, pay for performance and other value-based compensation. However, by far the most common method of structuring clinical compensation arrangements for employed physicians is productivity-based compensation. According to the 2014 Medical Group Management Association (MGMA) Physician Compensation and Production Survey: 2014 Report Based on 2013 Data2, approximately 39 percent of physicians are paid utilizing 100 percent productivity-based methods. Compensation per work RVU: Also known as an “eat what you kill” model. Physicians are paid a set dollar conversion rate for each work RVU generated. Graduated scale: Under this model, physicians are paid dollar conversion rates per work RVU based on a graduated scale. Potential of “overpaying” the physician if higher than expected productivity levels are achieved or if each individual compensation per work RVU rate is not within fair market value (FMV). Base guarantee plus productivity bonus: Under this model, physicians are paid a base guarantee and will receive incentive/productivity compensation for every work RVU generated above a pre-determined threshold. Work RVU=based compensation models offer several benefits to both the employer and employee and are relatively easy to implement making them a favorite among both parties. Physicians often prefer this method as the physician’s compensation will be independent of the patient’s ability to pay or hospital/health-system’s ability to collect, thus allowing the physician to practice medicine without having to worry about billing and collecting. In addition, the physician’s compensation is not subjective to variations in healthcare reimbursement as the work RVU credit is always given regardless of the collections actually received from the patient. Hospitals/health-system administrations often prefer this method as it incentivizes physicians to produce more, potentially leading to more revenue for the employer. The model is also relatively simple to administer and effectively rewards the highest producing physicians with the highest compensation. In addition, it allows the hospital/health-system to compensate the physicians for treating unassigned and self-pay patients which allows the hospital to serve the local community. In addition, MGMA has noted for several years the difficulty in knowing how to adequately reward the highest producing physicians without overpaying and creating possible healthcare compliance issues. The difficulty arises due to the unique relationship between compensation and production; more specifically, the inverse relationship between compensation and compensation per work RVU rates. As shown in the chart below for general surgeons, compensation per work RVU decreases, but compensation increases from the first quartile to the fourth quartile. The declining pattern in the compensation per work RVU by quartile of production data denotes that compensation per work RVU rates do not necessarily correspond to total compensation. In theory, one would intuitively think that the compensation per work RVU rates would eventually increase with increased production as the fixed costs of the physician would eventually be covered, thus creating an increasing profit margin per work RVU. However, the survey data does not reflect this pattern. As a result, the survey data is commonly misapplied resulting in compensation arrangements that may not be fair market value (FMV). For example, a general surgeon producing at the 90th percentile of work RVU (11,036) should not necessarily make the 90th percentile compensation per work RVU rate. As the chart below indicates, paying a general surgeon who is producing at the 90th percentile the 90th percentile compensation per work RVU rate ($91.02), would result in compensation 39.2 percent higher than the 90th percentile compensation from the MGMA survey data. In addition, the chart below illustrates the effective compensation per work RVU rates decreases as the physician becomes more productive. What this means is that physicians producing above the median work RVU should not necessarily make above the median compensation per work RVU rate. This is a very frustrating concept to grasp as most people would assume a highly producing physician should make more per work RVU than a lower producing physician. But what causes this disparity? In order to fully understand this concept, one must first understand how the data is derived in the MGMA survey. The compensation per work RVU rates are derived by dividing the total compensation for the physician by the physician’s total work RVU. This means that the physician whose total compensation is reported at the 90th percentile does not necessarily mean he/she is earning a 90th percentile compensation per WRVU rate. In addition, the MGMA survey does not actually detail “reported” compensation per work RVU rates from physicians who are compensated under such an arrangement. As a result, the survey data is potentially skewed by physicians who are paid base salaries that do not necessarily correlate with their actual production. For example, a newly hired physician normally has a “ramp-up” period for a few years. During this time, it is not uncommon for the physician to receive a base salary and once the physician has built up his/her practice the physician will be switched to a productivity=based model. Another plausible explanation is that even at the 90th percentile of work RVU, the physician is still not producing enough revenue to account for the large fixed cost necessary to run a physician practice. It is important to note, this concept is still being researched and a single answer has not yet been developed. Seek out an independent valuation firm if there is any concern that the proposed compensation arrangement is not within FMV. As the amount of physicians employed by hospital and health-systems continues to increase, the importance of structuring physician compensation arrangements that are within FMV are also increasing. Productivity=based models are still the most often utilized method of structuring physician compensation arrangements. However, these methods are also some of the most misapplied compensation models due to the inherent inverse relationship between compensation and productivity. With a better understanding of this relationship and the assistance of an independent valuation expert, developing a competitive and compliant physician compensation arrangement should be an easier and less stressful process. Source: MGMA DataDive Provider Compensation 2014. Used with permission from MGMA, 104 Inverness Terrace East, Englewood, Colorado 80112. 877.275.6462. www.mgma.com. Copyright 2014. Please visit the MGMA Data Insights page, available at: https://www.mgma.com/data, to learn more about MGMA DataDive®. Bartt B. Warner is a Senior Analyst with VMG Health and is based out of VMG Health’s Nashville office. Mr. Warner can be reached at (615) 777-7300 or by e-mail at BarttW@vmghealth.com.